Cisco Aironet Power Injector products increase the deployment flexibility of Cisco Aironet wireless access points and bridges by providing an alternative powering option to local power, inline power-capable multiport switches, and multiport power patch panels. 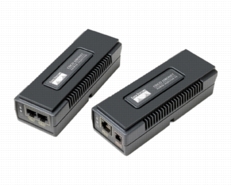 The power injector for Cisco Aironet 1100 and 1200 series access points (AIR-PWRINJ3) works with the power supply provided with the access point. The Cisco Aironet Power Injector Media Converter (AIR-PWRINJ-FIB) converts fiber media to Category 5 media and combines the resulting data signal with power for delivery to the access point or bridge. The power injector media converter accepts 48 VDC power from either the barrel connector of the local power supply or an alternative 48 VDC power source. When powered by an alternate 48 VDC power source connected using the provided power supply pigtail, the Power Injector Media Converter is UL2043 certified and suitable for installation in environmental air spaces. The local power supply is provided with the Cisco Aironet 1100, 1130AG, 1200, 1230AG and 1240AG series access points. Figure 1 illustrates possible deployment scenarios for the Power Injector and Power Injector Media Converter.